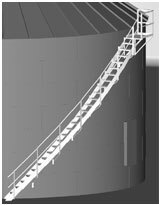 We offer a wide variety of solutions ranging from single components to complete grain-handling systems. CHOOSE THE COMPANY YOU CAN TRUST FOR GENERATIONS! Brownie is the world leader in the manufacture of Catwalks, Conveyor Support Systems and Leg Support Towers for the Grain and Bulk Handling Industries. The main objective at Brownie is exceptional customer service and our experienced sales staff will handle all your needs from start to finish. Brownie Support Towers are available in 5 standard sizes: 4-column 4'x4', 8' x 8', 10' x 10', 12' x 12', & 16' x 16'. They come with a variety of features that are standard in every tower. To learn more about Brownie Support Towers and the available options, please click on the image. Brownie Systems Catwalks come in a variety of sizes. With the standard sizes being: 3', 6', 9' sections & 42" high handrails. They also include a number of standard features. Computer Engineered for Freespans up to 120 feet. 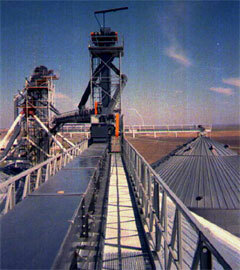 Conveyor Mounting areas up to 72"
To see all the available options, click on the image. To see all the different features with each style, simple click on the image. Copyright 2011 Grain Solutions. All rights reserved.